I know the pain of making decisions when you are starting a blog. 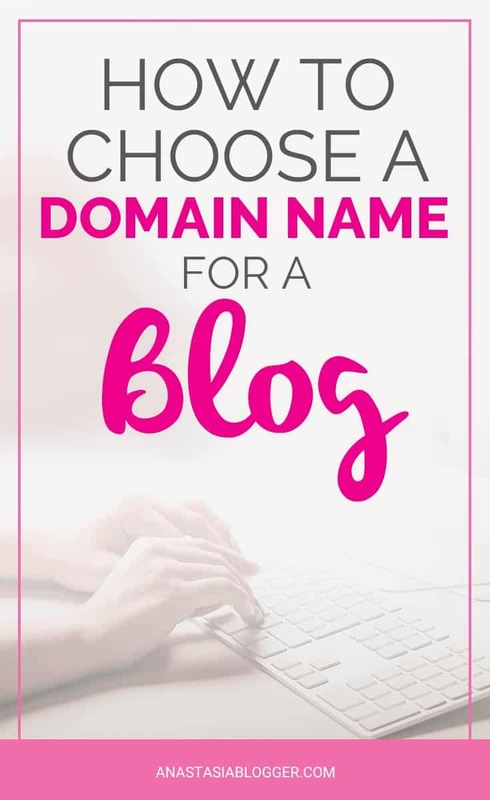 You are just a newbie in this area, nonetheless, you already need to know how to choose a domain name for a blog, how to register a domain, how to set up the best hosting for your WordPress site. You get overwhelmed and stuck at the very first steps of your life-changing blogging journey. I know how it feels. I don’t want you to lose your dream, and I want you to avoid the typical mistakes new bloggers make – I made them all, trust me :(. A mistake in choosing a domain name for a blog can be very costly. You put a lot of effort at the start of your blog, and later, if you decide to move to another domain, it can cost you not only money and efforts, but also may end up in traffic loss. This is part 2 of 4 of the Starting a Blog series. 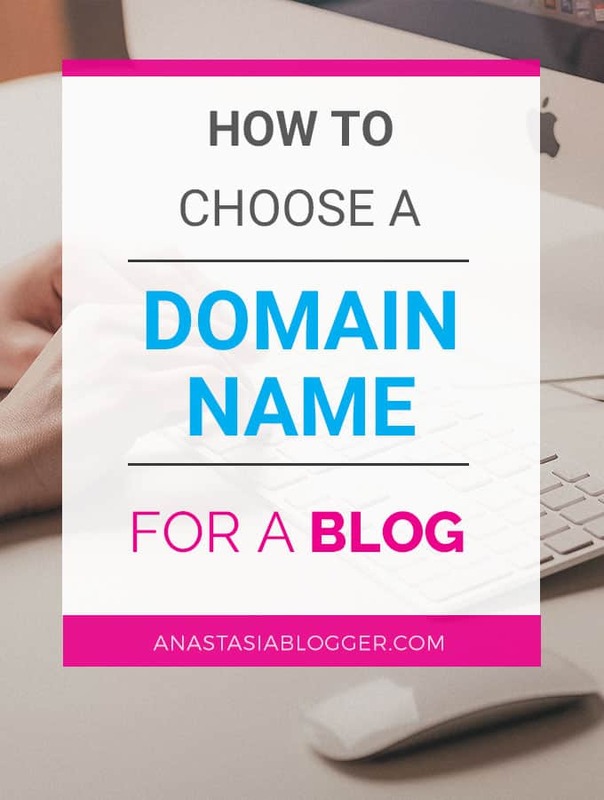 Before jumping into specific recommendations, let me just share a bit about how I picked the domain for this blog anastasiablogger.com. I spent thinking about my domain name about 1 hour. I had many ideas, discussed them with my then husband-to-be Nuno, and after all, I chose anastasiablogger.com to have my name in the domain and to keep it as non-specific as possible. I wasn’t sure for 100% about the main blog topic at the start, so I wanted to have a domain that doesn’t narrow the variety of topics covered on the site. At the same time, I wanted a domain that will be easy to remember, and associated with my personality rather than with a specific subject matter. I wasn’t sure for 100% about the main blog topic at the beginning, so I wanted to have a domain which doesn’t narrow the variety of topics I could cover later. At the same time, I wanted a domain that will be easy to remember, more associated with my personality rather than with a specific subject matter. To help you pick a domain name for a blog or online business, I made a list of the best industry recommendations. Most of them are not based on any official statements from Google or other potential traffic sources, but they are the collective wisdom of many webmasters and bloggers who experimented, made mistakes, lost time, tried again with new blogs, and found the best ways to pick domains. Before you make any choice regarding the domain name, make sure that there are no popular blogs with a similar name unless you want your blog to always stay in the shadow of the bigger competitor. To find blogs with similar domain names, just google your domain without the .com or other zones in it and check what comes up for this name in Top-10. Also, check your domain name for availability in the major social networks. A great service that helps you check most of the social networks automatically is knowem.com but I’d still make a manual research too. Just start typing in your domain name in the search of Facebook or other network and check the suggestions appearing. I know that often you come up with a great domain idea, search for the availability in .com zone, and oops! It’s available in .org or .net… sounds like a nice compromise. I didn’t avoid this temptation in my previous sites, and honestly, it wasn’t the best experience. Domains in .com zone are considered as more trustworthy. Also, .com domains are the easiest to remember, especially for users who are not very tech-savvy. Some of them type .com automatically, having no idea that any other domain zones even exist. Imagine, you have a name in a domain zone .blog, for example, coolesteverphotos.blog. Some visitors might simply add .com, and end up on a page with 404 error, at coolesteverphotos.blog.com. Numbers could look like a fun idea but most of the times people can’t memorize such domain names. The same applies to hyphens – avoid using them if possible, it will be better for your site in the long run. You can register your domain on some domain name registrar but for your first blog, I’d just go to a hoster like Bluehost who can give you a free domain (for 1 year!). By the way, I’m their affiliate, which means, if you buy their hosting following my links, I might get a commission at no extra cost for you. For more information, see my disclosures here. Using keywords which best describe your blog’s main topic, or your business promoted on the blog, is a great idea. This way your domain name works not only for the audience to remember you site address easy, but also helps search engines, like Google or Bing, to rank you better for the relevant quires. In some niches finding an available domain with keywords, but you can exercise your creativity here and try to add some extra words to look different from competitors. Some bloggers get carried away adding keywords to the domain and forget about even more important rule – your blog name has to be short, otherwise, no one will ever remember it. Something under 15 characters is ok when the domain name gets longer than this, I would seriously consider some adjustments to your ideas before you make the final decision. Your domain, like any word in any language, lives a double life – it can be spelled, and it can be pronounced. Say it aloud at least 5 times, ask your family or friends, what do they think, is it easy to repeat after you? Now, before showing to them the written name, ask them to spell it as they heard from you. Did they easily spell without mistakes? All this is very important because you don’t want to disappoint those people who remember your blog name and come back frequently directly to the domain name. They are your best and most loyal audience! Yes, it will take you a bit longer to pick a domain name for a blog, which sounds unusual, is easy to memorize and that makes your site unique. you avoid potential problems with copywrite and trademark violations of other site owners or brands. Choosing a domain for your blog that explains to users what is your main topic is a good idea. But you have to avoid being too specific. Imagine, you are currently all into experiments with your hair color and you know a lot about hair dye, you choose a domain that includes this keyword, something like hairdyeblog.com and start writing passionately. For some time. But then you get into healthy natural hair thing, and you decide to post about treatment hair products, or even wider – about beauty products in general. You can start it but your domain hairy blog will sound weird and irrelevant to the wider new topics. Even if your current blog or site doesn’t need your name in it, I always recommend people to consider registering a site with their name. You never know what is coming next and whether you might need to use your name as a brand in the future. If you register the domain with your name and keep it even without a website, it might become useful sometime later. Using your name as a brand fits many professions. You could use your blog to establish your photographing work, designer skills, personal coaching services, or if you are starting a model/acting/singer/dancer career, etc. Also, some of us don’t use real names for the professional field, in this case, a pseudonym, nickname which you need to promote as your personal brand, could also be a great idea for a domain name. You will be surprised to know how many domain registrar companies are available online, and how prices for domains can differ even within the same registrar. The price will often depend on how pretty or in demand your chosen domain name is, some domains can cost thousands of dollars, but for most of the bloggers there is no need to pay that much. In fact, there are even free domains available (to be more precise, the first year is free) if you get the domain name while registering your hosting with Bluehost. When you are starting a new blog, you can take advantage of this offer and get a free domain name. Bluehost is one of the largest and oldest hosting companies, my blog is currently hosted on Bluehost, I recommend it as a user, and as their affiliate as well, which means if you buy their hosting following my links, I might get a commission, and this is the best and totally free way for you to thank me for the recommendations in this post 🙂 For more information, see my disclosures here. For those of you who need further beginner guide that will help you start a blog in just a week, I created an opt-in email course. To get onboard and know all the secrets which I learned hard way by trying and building multiple sites before I started this blog, just subscribe in the form below and confirm your subscription via email.